Sub-Title : Discover a Secretly Incredible Life in an Ordinary World. 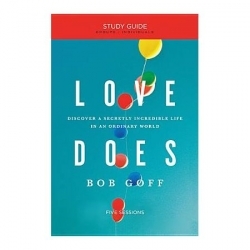 In Love Does, a five-session, video-based small group study, you will discover the whimsy of New York Times best-selling author Bob Goff through a sometimes humorous, thought-provoking, meaningful lesson that makes faith in God simple and real. You will discover the paradigm shifts, musings, and stories from one of the world’s most delightfully engaging and winsome people. What fuels his impact? Love. But it's not the kind of love that stops at thoughts and feelings. Bob's love takes action, just like Jesus did. Bob believes Love Does. When Love Does, life gets interesting. Light and fun, unique and profound, the lessons drawn from Bob's life and attitude just might inspire you to be secretly incredible too. This companion study guide is designed for use with Love Does: A DVD Study and will lead you and your group deeper into the video content (sold separately) with video notes, group discussion questions, and between session personal reflections and actions to enhance the group experience.